I myself had never even heard of kohlrabi until I received my box of fresh produce from Farm Fresh to You and found it lying amongst all the other beautiful and lush produce. Eager to find out more about it and how to use, I went straight to work researching it and determining the best way to prepare it. I ate some raw, and then put it straight to work in this pickled kohlrabi recipe and was thrilled with how yummy and filling it was. At 0 Points, it’s a fabulous Weight Watchers snack idea, and much healthier than a jar of pickles. 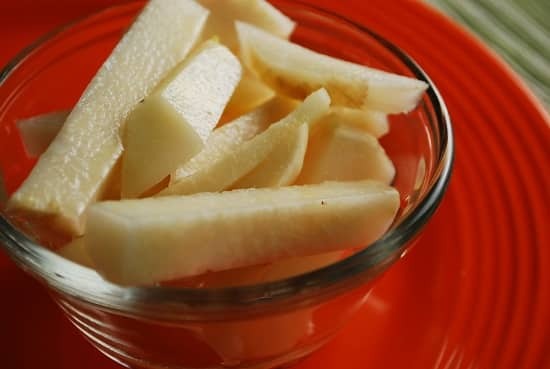 So the next time you are at the grocery store, don’t hesitate to grab a few kohlrabi and give it a try! A fresh and delicious new way to enjoy pickled vegetables, this picked kohlrabi recipe is so easy, so delicious and full of vitamins. Perfect as a salad topper or to serve with your favorite Weight Watchers sandwich recipe. Combine all ingredients in a large bowl or Tupperware container and seal with a lid. Shake well for about 5 seconds. Place in refrigerator and let sit for at least 3-4 hours.